Got questions? We’re here to help! Below you find answers to users’ most frequently asked questions. If you cannot find the answer to your question, contact our technical support team at: help@mynu-book.com. Q. What is a Nu-book? A. It is an ebook that a publisher offers its readers when they purchase the print copy. To learn more, visit the section What is My Nu-book? on my.nu-book.com. Q. How do I know if a print book comes with a digital version? A. Simply look for the silver and black My Nu-book label, which is affixed on the cover of the print book provided by participating publishers. A. A unique code (token) is printed on the My Nu-book label affixed on the cover of the print book provided by participating publishers. This token determines all the characteristics of the ebook (the format, supported devices, how long the access is available for). After purchasing the print book, the reader can reveal the code and verify it online at my.nubook.com. 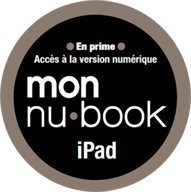 To access an ebook, your customer must activate a token within the Nu-book application. The Nu-book application must already be installed on a compatible device before activating the token. Q. Can I access my ebook from any device? A. To determine what devices the ebook is compatible with, look at the My Nu-book label on the cover of the print book. The label will indicate on what device(s) the ebook is accessible. The number and types of compatible devices can vary from book to book, depending on the publisher’s choice and available technologies. For example, if the label indicates iPad, the ebook can be accessed via an iPad. However, additional devices may be made available between the moment the book is printed and when it is arrives in bookstores. If this is the case, you will be notified when you validate your token on the my.nu-book.com web site. Q. The code has already been revealed. Is it still valid? A. It may happen that the Nu-book code was revealed when the label was affixed on the book or during shipment. If this is the case, the code is most probably still valid. Ask your customers to try and verify the codes. Advise them also to keep their proofs of purchase. If the code was already validated for fraudulent use, an error message will appear when your customers try to validate the codes. To obtain another code, your customers must send their proofs of purchase to help@mynu-book.com. Q. My customer does not want the digital version of the print book. What do I do? A. Access to the ebook is a bonus offered by the publisher when customers purchase a print copy. This bonus cannot be exchanged for money. Q. Why do I need to create an account? Q. What do I need to create a Nu-book account? A. There are only a few fields to fill out (name, username, and valid email address). Within a few seconds, you will be able to active your Nu-book tokens and benefit from all that ereading has to offer! Q. How can I get Nu-book tokens? Q. How do I active a token? A. You can verify a token directly on the my.nu-book.com web site. To activate it, you must first download the Nu-book ereading app on a supported device (the label will indicate the device(s) that you can use to access your ebook). Q. When I enter my code on my.nu-book.com, I get an error message indicating that the code is invalid. What do I do? A. If you purchased a print book with a My Nu-book label and are sure that you entered the code correctly, contact help@mynu-book.com with your proof of purchase. You will be supplied with a new code. Q. I do not have a device that is indicated on the My Nu-book label on my print book. Can I still access the digital version? A. It is very likely that access to the ebook is possible from a device other than the one mentioned on the label. You can check your code on my.nu-book.com home page and see what are the compatible devices. Q. Can I give my code to someone else, as though I was lending this person my print copy? A. If you have not activated your My Nu-book token, you can give it to your friend or family member. However, once the code is activated, it will be linked to the account of the person to whom you gave the code. You will therefore not have access to the ebook with your My Nu-book account. Q. I don’t want the digital version of my print book. Q. I used my code to download a book on my tablet. I would also like to install it on my phone but when I enter the code, the access is denied. A. In fact, the code that is available as a bonus with the paper book is valid for a single use, and it gives the right to download on a single device. However, we suggest that you contact the publisher to see if any additional digital offering in connection with My Nu-book. Q. I deleted a book from the library and my code no longer works. How do I get my book? A. The code can only be used once. However you can download the book again. Simply go to the My Account section. Make sure to be logged into the same account that you already used, then go to Your history section where the book should be found. You can download it by selecting it in the list and pressing the Download button. Q. I changed my tablet due to a technical failure and unfortunately the code no longer works. Is it possible to reactivate it? A. In fact, the My Nu-book digital promotion in conjunction with the printed book only entitles a single device. However, given the technical problem, please contact help@mynu-book.com with your details to reset the identification of the device that is linked to your account. Nu-book® is a registered trademark of Diffusions Nu-book inc. All rights reserved.